When Sirius and XM Radio was first introduced over ten years ago, the default mounting location was the windshield. Why? Because that is what was included with the radio when it was purchased. Seemed to make sense as the radio received signals from a satellite and the radio could see it if in the windshield. Never mind it was really the antenna that received the signal. Windshields and satellite radio just seemed to go well together. Today there are a lot of other locations and one of the most popular is the dash. Now let’s discuss the topic of Sirius XM Radio Car Dash Mounts. Why would one be interested in Sirius XM car dash mounts? There are two main reasons. First, it’s a more stable mount versus the windshield mount. Many of the windshield mounts use a flexible gooseneck that tends to shake with car vibrations. Dashboard mounts tend to be a little easier to install and remove. The second most popular reason for using a dash mount is that it might be illegal to attach anything to your windshield. States like California do not permit attachment to a car windshield and you can read this article to see if your state is one of those. There are two types of Sirius XM car dash mounts. The first type uses adhesive to attach to the dash. Easy to install, not easy to remove. This is what we call a permanent dash mount because the adhesive used isn’t meant to be easily removed. Most of these mounts use an adhesive known as VHB or Very High Bond. VHB is a very expensive adhesive pad that works real well. The key is to ensure the area you will attach it to is clean and that you allow the mount to set overnight in a climate that isn’t overly hot or cold. 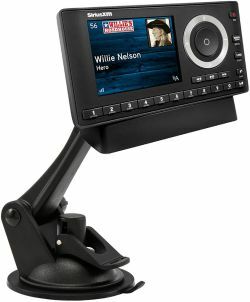 Another type of Sirius XM car mount uses a weighted base that is typically a bean bag variety. This is known as a temporary mount. That means it’s quick and simple to install and remove. Works best on clean non sloped dashboards. Normally weighing in at over one pound, these are often coupled with existing suction cup mounts to provide a complete mounting solution. The Windshield Dash Suction Car Mount for XM and Sirius Satellite Radios is a good example of a mounting solution that uses the VHB adhesive disk for attachment to the dashboard. The adhesive disk is 80mm and the included suction cup will stick to it just like it’s a windshield. The mount includes a single T ending for older XM radios as well as a 4-hole AMPS plate that attaches to the back of existing Sirius car cradles. Screws are provided to attach the AMPS plate to the back of the Sirius car cradle. Temporary solutions that couple your existing suction cup mount with a bean bag include the Arkon Friction Car Dash Mount . This is the best bean bag mount that I have seen because it combines a security anchor with the mounting base. The mount has an attached 80mm smooth round plastic plate which is a bit larger than the diameter of most suction cup mounts. You will attach your suction cup mount to the center plate just like it was your windshield. Most suction mounts made these days feature a vacuum locking base so be sure that lever is flipped down for a firm attachment. The Arkon mount features an open front. The open front is a nice to have especially if your suction mount is short or if you plan to drape a cable over the front with the intent of plugging into your vehicle’s power socket. Like other friction dashboard mounts on the market, the bottom is covered by a rubber coating which minimizes movement when on the dash. Dashboards that have significant downward slopes and those that have been oiled will affect the friction feature of this mount. A feature that is unique to the Arkon Friction Dashboard Mount is the inclusion of a safety anchor. The safety anchor has an adhesive bottom and can be placed on your dashboard. The mount itself has a small loop attached to the back of it which allows you to attach it to the adhesive safety anchor. The photo that is located within this article is the Arkon Car Dash Sticky Suction Car Mount for XM and Sirius Radio . This is a hybrid mount. The suction cup part of the mount has a sticky surface to it that can attach to both a textured and smooth dash. It’s somewhat unique. It can be used more than once as the stickiness on the bottom can be recharged by simply rinsing it in warm soapy water. While you can install and remove it repeatedly, I have found that the stickiness tends to diminish with repeated removals. It’s best to just let it stay in place unless you don’t mind doing a recharge rinse every few installs. You may have noticed that all three mounts are made by the same company. Arkon is one of the few manufacturers that make mounts for Sirius XM Radio. They introduced their satellite radio line more than ten years ago and have continued to market these since. I have used Arkon mounts for my Sirius XM radios for more than ten years and they work quite well so can recommend them from first hand experience.